Once in awhile, I happen upon a beauty line so filled with fun and amazing products it's all I can do not to squeal with joy when I play with them. Other times, I rediscover a brand I loved during my teenage years and instantly remember all the reasons why I couldn't get enough of it. Hard Candy takes the place of the latter. Filled with fun and fancy packaging, sparkle and shimmer galore and both old and new favorites alike, this beauty chick just adores everything the line has to offer! My fave has got to be the nail polish -- ever since my days as a junior high mallrat, I've loved the glittering shades like Stop! (gold glitter-infused red), Vinyl (iridescent pink) and the ever-popular Trailer Trash (metallic silver). 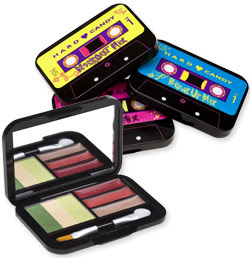 But always a sucker for inventive packaging and products, I totally dig the new stuff too, like the utterly cute Mix Tape Makeup Palette in Break Up Mix -- 3 shadows and 3 lipglosses encased in a tiny lacquered black box that looks exactly like a cassette tape from the 80s! Whatever your pleasure, you're sure to find it. What are you waiting for? Note: Hard Candy is no longer available.